When it comes to investing, it pays to get the right advice from the outset. We provide specialist property investment advisory, strategy & planning services to help you invest safely over the long-term. A structured investment process that reduces investment risk. We take a holistic approach to investing and seek to drive optimal value across the full property investment lifecycle. We focus on ensuring our clients make more informed and efficient investment decisions, thereby enhancing their returns and minimising their risk. 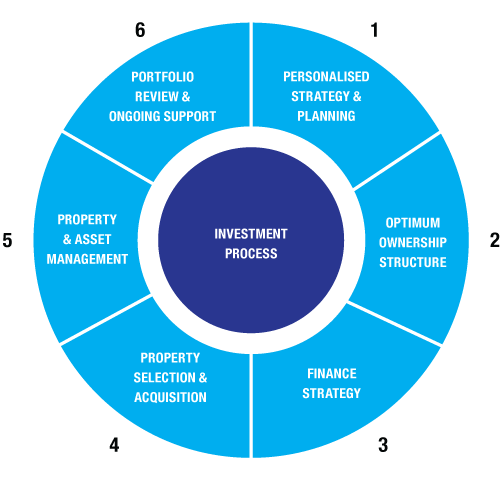 We do this through a highly structured and methodical 6 step investment process that has been designed to mitigate the majority of risks and separate the emotion from the fundamentals of property investment. At Riveren Property, we recognise that different property investors have different requirements and goals as well as the means to reach those goals. As such, our wealth creation journey commences with a detailed and thorough assessment of each client’s financial position, current property portfolio and a realistic assessment of long-term goals. Our consultants work in conjunction with a client’s financial advisor with due consideration of the overall strategic objectives and risk profile. We undertake detailed financial modelling for a number of property investment scenarios over different timeframes. This culminates in the production of an individual strategic property investment plan that details a client’s investment goals and their action plan. We also incorporate financial forecasts for a number of scenarios so our clients fully understand the implications of their investment decisions. In consultation with a financial adviser and accountant, we ensure that the investment strategy is implemented under an optimal structure to minimise financial risk and to maximise the client’s after tax return. This includes an assessment of whether any investment properties can and should be acquired through an SMSF, trust or company. We take into account our client’s tax strategy, asset protection preferences and estate planning needs. We review a client’s existing financial arrangements and credit facilities and facilitate raising of finance, either through existing relationships or through our network of trusted mortgage brokers and lending institutions. Where a financial solution has already been provided by the client or their adviser, we simply review this position. We run sophisticated financial modelling to ensure that appropriate financial buffers are in place and that a client is fully informed of their upcoming financial commitments, what their mortgage repayments will be and the source of funds for these repayments. The correct finance strategy is about more than just interest rates and choosing which lending institution to use. The right strategy can provide access to more funding options that can accelerate the client’s property investment goals, whereas the wrong strategy can hinder investment plans and impact the client’s ability to hold on to their investment for the long term. Once a comprehensive strategy has been agreed, Riveren then actively works with the client to implement this strategy, removing the stress and risk out of finding and buying an investment property. Our industry leading research and due diligence process forms the foundation for our property selection and acquisition service. We leverage this research together with the deep nationwide network of our acquisition team to identify and source properties that will outperform over the medium to long term. Once we have narrowed down appropriate property investment options, we present these to the client for review and consideration. If clients wish to proceed, our support team then steps in to assist in the entire process, from contract negotiation through to settlement, ensuring a seamless process that mitigates the majority of risk. Our team will work in conjunction with the client’s own legal and financial team to complete the purchase or if a client doesn’t have existing relationships, we can recommend a team from our panel of independence trusted advisors. The team at Riveren Property are experts in optimising real estate investments. We regularly and systematically review each asset in a client’s portfolio to assess whether it is meeting its full potential – both in terms of asset value and income – and then determine an action plan to achieve it. Actions that we could potentially recommended include undertaking refurbishments, renovations, subdivisions or even divesting a property and re-investing in a superior location. In the event a client needs to divest one of their investment properties, we offer a bespoke sales advisory service where we act as an independent advocate to assist clients choose the best selling agent for each individual property and then manage the agent and selling process to achieve the best outcome and sales price. Every property recommended by Riveren has met our stringent and methodical investment criteria and gone through our comprehensive research and due diligence process.